Everyone chills on the beaches of Goa and soaks in the vibrant vibes and fortunately enough, Goa’s cuisine is as intriguing as is its lifestyle. Being a coastal cove, Goa is blessed with a variety of seafood variants and uses the best of coastal ingredients to dish out its flagship recipes. 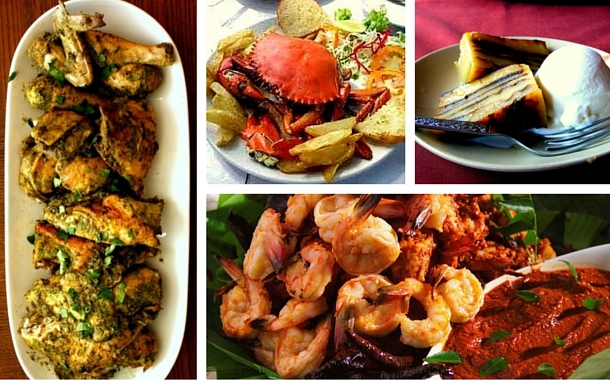 From seafood to sweet-food, we have everything that you should savour while you are chilling in Goa. A handsome meaty piece of chicken tangdi rubbed with a green paste made out of the goodness of coriander, chilies, spices, garlic, ginger and lemon juice is fried until the room is filled with an earthy, peppery fragrance. Cafreal sailed to Goa along with the African soldiers known as Kaffirs. Sha-Coo-Ti is a local delicacy that oozes out the traditional flavours of coconut and fresh spices. The underlining flavour of this dish is defined by the use of white poppy seeds. A motley of spices like roast cinnamon, cardamom, aniseed, black pepper, coriander, Kashmiri red chillies, star anise, maize, nutmeg, and turmeric are used to make the paste, which gives it an edgy flavour. Originated in the Portuguese pockets of Macau, this unique dish which is a cusp between a curry and a pickle, and was embraced in the Goan households since the colonial times. A pickled-paste called ‘galmbo’ made with dried shrimp, garlic, pepper, red chillies and feni is used in its preparation. This paste gives it a distinct piquant flavour. The modern balchao generally uses coconut vinegar in lieu of feni and reprimands the use of dried shrimps because of its strong smell. Balchaos are even prepared out of fish and pork. A full-bodied fresh catch of fish is slit in the centre and loaded with a spicy red paste made from Kashmiri red chillies, garlic, cumin, peppercorns and tamarind. This stuffed fish is then shallow-fried and given an irresistible crunch on the outside. The paste receives its delicious piquant flavour from the vinegar that goes in the blend. Although a reacheado (meaning stuffed in Portuguese) can be made with any fish, its versions dished out of mackerel and pomfret are popular. A classic Goan fish curry that eludes a melange of flavours from ground coconut, kokum and a blend of paste made from local condiments and spices, has a distinct flavour reminiscent of the serene Goan coastline. True to its name, Ambot tik (sour- spicy) has a complex flavour from all the coastal ingredients. A generous portion of sliced onions are diced in a vessel along with a strong spicy paste made from local condiments and spices. The sour-tangy taste comes undoubtedly from the kokum, but dried mangoes are the hero of the dish. An assemblage of well-seasoned and spiced pork is sun-dried and smoked until the pork leaves out a woody, tantalising smell. Stir-fried with diced onions, these churicos will leave your taste buds in a total frenzy. Pork Vindaloo is spicy and tangy at the same, and leaves your taste buds tingling for more with every bite. A dish as legendary as vindaloo comes with a history. The Goan cooks sailing on the ships with the Portuguese used preserved pork and garlic soaked in wine to prepare this tasty dish onboard. From the oceans, when it came to the kitchens, it was Indianised by substituting vinegar for wine with the addition of Indian spices. What do you get when the spicy flavours of Goa, marry the tangy flavours of Portugal? You get sorpotel - bringing the best of the two worlds together. Served as a Christmas feast, the pork imbibes in the earthy flavours of spices and a hint of tanginess from vinegar. A Sorpotel is eaten with sannas or Goan pão. 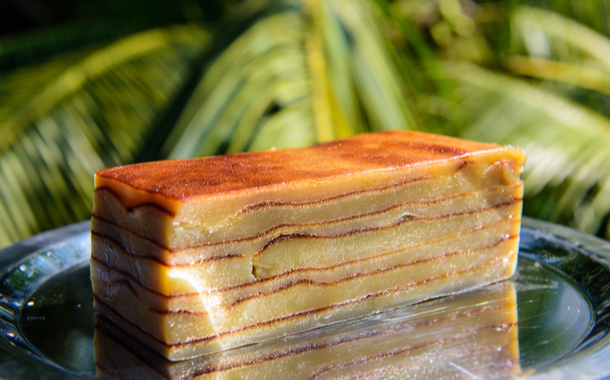 Bebinca is a soft, sweet delicacy made by baking layered coconut pancakes one above the other. Bebinca is an outcome of tremendous labour of love, and each layer of pancake is baked before the next one is scrupulously placed on it. The coconut pancake is a sweet concoction made from coconut milk, flour, eggs, ghee, sugar and vanilla extract. This signature dessert is baked in a specially-made clay oven. Made especially in the Goan kitchen during the festive season, this sweet-dish is a way to greet and welcome guests during Christmas. Sweetened to perfection with jaggery, the batter contains coconut milk, rice flour and cashews. Cooking this tempting sweet takes as long as nine hours. To get the best from your holiday, check out our Goa packages.